Simon is a vibrant and passionate environmental educator, photographer, film maker, ornithologist and environmental biologist and a master at sharing nature stories with adults and children alike. Whether it’s a vivid description of an echidna foraging for termites, a honey eater snuggled in its nest, or a tiny tortoise hatchling in the winter creek, his stories amaze and inspire all around him, young and old. 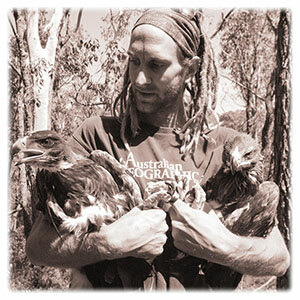 Currently researching and specialising in recording and documenting the breeding habits of wedge-tailed eagles throughout Western Australia, Simon is utilising cutting-edge satellite-tracking methods in his research to study the details of eagle movement and flight routes. He believes that education is one of the most important tools in conservation and environmental change and is a passionate advocate for ecological education. Simon’s enthusiasm is so engaging, and his passionate talks will have you sitting on the edge of your seat eager for the next incredible episode. He is well-educated in his field of expertise and manages to intersperse facts with lots of humour so that audiences are guaranteed to have a fantastic time. In 2017 The Sound Temple assisted with some crowd funding events to support his PhD. This year we are over the moon to have him back in various capacities to engage with all demographics of our community.